Y-Tags feature the exclusive Surgi-Tip™ tag tip– a unique four-sided tip design for a precise incision, faster healing, and improved retention. Calf tags have a printable area of 2 1/8” x 1 1/2”, and are available blank or pre-numbered, or they can be custom printed with any text, logos, or numbers using 100% PureLaser™ permanent imprinting. 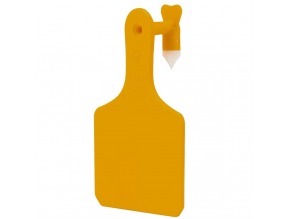 Y-Tags can be applied with the Y-Tags applicator or many other popular one-piece tag applicators. Comes in 25 / bag.